Before we show you how to clear Android temp files, we would like to tell you what is temp file. Temp files is the temporary files that save the working result when you use office software or other application. The temp files can prevent the accidental damage to the files. Every time you run the program the temp files will be automatically generated and accumulated. Other junk files like crash logs are the files that record the situation when your apps get crashed and cache is the files left in the memory space when your app or software work. One word, these files will be generated automatically as long as you use the software, so it is better for you to clean them regularly. In this article, we are going to share you with 3 different methods to delete temp files from Android device. Step 1. Turn on your Android phone and tap on the Settings app. Scroll down the Settings page to select Apps or Application Management in the section. Step 2. After that, a list of applications will be displayed on the screen. Here you can find the app from which you want to delete the temp files in the list, tap on it to enter the App Info page. Step 3. 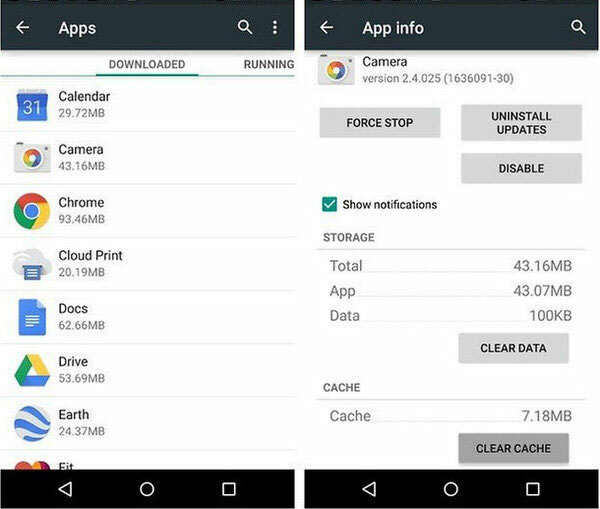 On this page, you can simply click the option Clear Cache and Clear Data to clear temp files from the selected application on your Android phone. You can also delete temp files from your Android phone or tablet from the menu of Browser. Here are the detailed steps for different browsers on your Android devices. Step 1. Turn on your Android phone and go to click "Settings" app. Step 2. Scroll down the Settings page to select the "Privacy" option. Step 3. Now, you can see different browsing data are arranged on the main interface. Step 4. Tick out the temp files you want to delete and hit the "Clear" option begin the erasing process. Step 1. Open the Chrome app on your Android phone. Step 2. Go to the menu icon and choose "Settings" option. Step 3. Navigate to the "Privacy" section and choose "Clear Browsing Data" option. Step 4. You can see the below interface. Just tick out the files you want to remove from your Android device and hit the "Clear" option. Step 1. Run Firefox app on your Android phone and touch the menu button (three dots in a vertical bar) in the upper-right corner of the browser's window. Step 2. Tap on "Settings" > "Privacy" options from the menu. Step 3. Choose and click on the "Clear private data" option and then tick out the files that you want to delete. Step 4. Finally, you can hit the "Clear Data" option to clear the temp files on Android. As you can see from the content in the above, these temp files are distributed among different apps' and software's folders. So finding and cleaning all of the files will be a time-consuming effort. Luckily, there is free software that can help you clean all the temp files in no time without any hassle. And that is the Android Data Cleaner. The software can scan and delete all the temp files I list above and it can support all brands of Android devices like Motorola, HTC, LG, Samsung, Sony and so on. You can download the software and then follow the steps below to begin your cleaning process. Install the Android Data Cleaner on your computer and run it. Connect the Android device to your computer with its USB cable. And install the MobileGo connector on your device as requested and then you will see an interface like this. Then select the mode to clean temp files on Android. Simply select the Erase All Data mode to go on. You will see a new window, just enter the "delete" on the box to confirm your action and click the Erase Now button finally to clear temp files from your Android device. Additional Tips: How to Speed up Android Phones? As time goes by, the operation speed of Android device will be slower and slower, which is the result of the large number of junk files that occupied the space of storage card. People know that erasing the unnecessary files will free the memory space and enhance the user experience and mobile phones performance. But many people find that there are still something occupied the memory space after they delete files. Actually the files that you can clean manually are the data that you can find directly on the SD card or SIM card, and there are some junk files like app caches, app cookies, app temp files, app crash logs, download temp files, photo caches, user storage that you can not find all of them directly and easily. To clean and speed up the Android phones, you should clean these junk files regularly. How to Improve Android Performance and Speed Up the Operation?